"Glass fusing offers limitless opportunities to create something new, something unique, something that can be looked at in so many different ways by different people." Glass is a versatile material that can be made into a variety of items for different purposes, from decorative use to industrial applications. 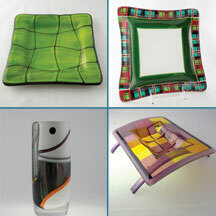 We offer a variety of pre-made glassware to pieces that can be customized on your specifications. Whether displayed in an office or used in your home or garden, they can create a dynamic focal point. I have always dabbled in the arts - photography, painting, etc. and I love the technical aspects of those mediums. In 2013, I explored the creative medium of Glass Fusion and I couldn't be happier. It has become a passion that allows me to intentionally combine the creative and technical aspects to fulfil a vision. Each time I start a new project, I am fascinated by how the light hits the glass, the colours and I am inspired! Copyright 2015 Waterford on the Rideau - Glass Emotions (GEMS). All rights reserved.